You’d hardly forget your main Gmail account password. But, if you had multiple Gmail accounts for various passwords, it might be hard to remember them all especially when you set different passwords for them. Also, forgetting passwords is easy when you have just changed your password to something really secure and you don’t login to your account for a couple of days. The traditional way of recovering lost passwords is by going through the ‘Forgot my password’ link. 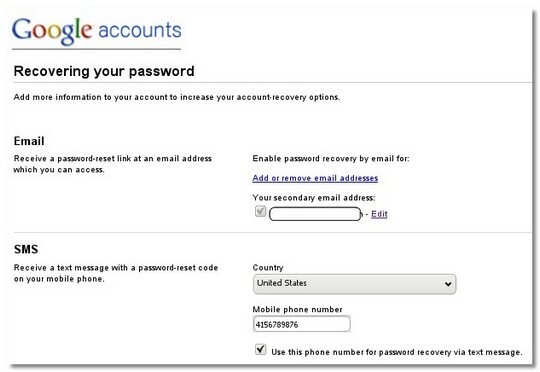 Gmail now offers another way to recover your password – through SMS! In the SMS section, enter your mobile phone number and hit save. While you are it, keep your secondary email and your security question up to date. If you use a secure online password manager like Passpack, then you wouldn’t have to worry so much. Nice tip but why would anyone want to recover their password on their mobile? .-= alnect komputer´s last blog ..Daftar Blog (Indonesia) Do Follow ber PR (update) =-. I think that receiving passwords via mobile is standard nowadays, but thanks for the tip. .-= darmowe mp3´s last blog ..Wyszukiwarka mp3 =-.